← Beginning our 50th Year Anniversary with a Major Open Space Purchase! 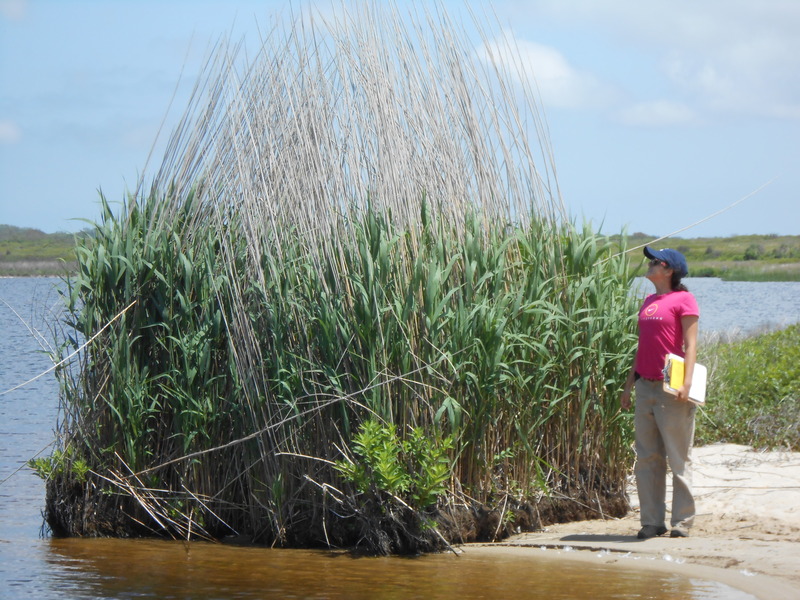 NCF Field Assistant Emily West, surveying a “raft” of Common Reed at the south shore of West Hummock Pond, Head of the Plains, 2012. Environmental Science students at Nantucket High School (NHS) have been studying the ecological impacts of non-native invasive species around the world. Just before the holidays, Research Technician/Field Supervisor Kelly Omand, a member of NCF’s year-round Science and Stewardship staff, visited the NHS Environmental Science classes. Their teacher, Mr. Hanlon, had already provided a variety of background information, and the students had been pursuing their own research. To tie in their learning to local level, Kelly introduced the students to some of the most aggressive invasive plants that now call Nantucket home. In case you are not familiar with the term, “non-native invasive species” are plants or animals that have been imported by humans from another part of the world, either intentionally or by accident. Once in their new habitat, they reproduce rapidly and soon spread. They often crowd out native plants and animals, and can even change soil and water quality. Without the diseases and predators of their homeland, they can quickly dominate the landscape. Invasive species are thought to be a top threat to many endangered species, and to global biodiversity. They also may become costly pests in the home garden, farms, and recreational areas. Some native Nantucket species, like grape or scrub oak, are very aggressive growers, but they are true island locals; other native species have evolved to coexist with them over thousands of years. Porcelain-berry (Ampelopsis glandulosa, formerly Ampelopsis brevipedunculata), pictured below, is a non-native invasive vine that resembles our native fox grape until the multicolored berries appear. This attractive vine is quickly spreading and replacing fox grape in many areas of the island. Invasive Porcelain-berry growing at Squam Farm along trail edges, 2011. Students learned about how each of these plants may impact local ecosystems and alter wildlife habitat. The presentation included photos of sites around the island where invasive plants have taken hold, along with close-up photos to help students learn to recognize the plants. Kelly explained about a local group called the Nantucket Biodiversity Initiative (“NBI” for short) which works to unite the various island conservation groups, the town, and the public, in order to protect biodiversity. NBI’s Invasive Plant Species Committee helps island conservationists to coordinate on invasive plant research and management. Another major goal of the committee is educating homeowners and gardeners on what they can do about invasive plants in their own backyard. NHS students were encouraged to participate in future volunteer work organized by the Invasive Plant Species Committee, such as garlic mustard pulls at the Old Mill and spotted knapweed digs along the bike paths bordering NCF and Land Bank property along Madaket Road. NCF Field Assistant Nora Harkness with invasive Spotted Knapweed, Tupancy Links, Nantucket, 2011. Volunteer student groups and concerned citizen volunteers are very helpful in manual removal projects. A couple hours of volunteer time multiplied by the number of volunteers in a group= many extra hands, and a much greater area of weed control. This entry was posted in Invasive Species and tagged educational outreach, invasive species, Nantucket, volunteer opportunities. Bookmark the permalink.